The continental equivalent of the most temperate part of the last interglacial (MIS 5e) is called Valdivia in southern Chile. It is characterised by extensive terraces mostly composed of detrital sediments and pyroclastic flows. Peat deposits are found within these terraces. In this paper we analyze the leaf architecture of fossil leaves collected from a peat layer at the base of the Mancera interglacial sequence, on Mancera Island, off the coast of Valdivia (near 40 degrees S). The stratigraphic position, the presence of in situ logs and the composition of the plant species found therein suggest that the accumulation of plant remains occurred in a continental, palustrine environment. 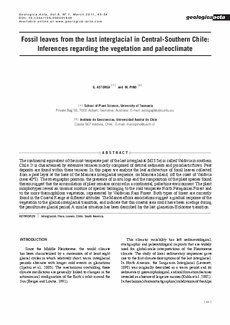 The plant morphotypes reveal an unusual mixture of species belonging to the cool temperate North Patagonian Forest and to the more thermophilous vegetation, represented by Valdivian Rain Forest. Both types of forest are currently found in the Coastal Range at different altitudes. The Mancera flora associations suggest a gradual response of the vegetation to the glacial-interglacial transition, and indicate that this coastal area could have been a refuge during the penultimate glacial period. A similar situation has been described for the last glaciation-Holocene transition. Interglacial. Flora. Leaves. Chile. South America.